The ‘Tools for Arms’ approach in Mozambique is a case in point and a spearheading example: For the very first time, civil society is taking responsibility for the population’s disarmament at a national level, thereby making an essential contribution towards peace and reconciliation. 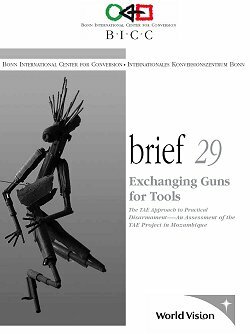 BICC brief 29 investigates the ‘Tools for Arms’ approach in Mozambique and looks into the general preconditions that lead to the project’s success. It also tries to identify weak areas so other actors can learn from this experience and apply it to other contexts. WORLD VISION and BICC jointly hope that this documentation will help encourage other post-war societies to commit themselves more fully to the disarmament of their population and to raise awareness about the immense risks of small arms.